Discussion in 'Plugins' started by nishalp, Apr 5, 2015. This plugin will go and kill all the 3 mobs and then complete the 3 fates for each book. It pops the fates if the NPC's are around. It also kills any pre-req fate such as the ones for Breaching North and South Tidegates. It will first wait for Gauging fate. To use the plugin, just set the bot to Orderbot or Fatebot and enable the plugin on the plugin tab. When you start the bot, it will find the book and start working. 1. Updated the Level to 60 for profiles. 2. Fixed issue in XML in profile. Known Issue - Some Fates are not auto starting. Looking into the problem. 1. Updated plugin to work for mob sets after update. 3. Removed dismount chocobo when teleporting since you can port while mounted now. 1. Temporarily stopped plugin from killing mobs in book until tool is updated. 2. Currently the plugin only takes care of the fates for you. 1. Updated TreeRoot to use new method and gentle options. 2. Fixed some profile problems. 1. Clean up on some code around mounting chocobo and logging. 2. Included Latest versions of the profiles from Keebler. 1. Updated to use BotPlugin instead of IBotPlugin based on RB changes. 2. Changed ChangeBot function to use OnStart and OnStop Events for TreeRoot. 1. General cleanup when book is complete. 2. Set back to Order Bot when complete and load blank profile. 1. If you come in towards the end of a required fate and don't get credit, will reset and wait again for the fate. 1. First completes "Gauging South Tidegate" and "Gauging North Tidegate" fates before completing "Breaching South Tidegate" and "Breaching North Tidegate" as the pre-requisite fates. 1. Enemy of My Enemy is now using standard Fate Bot since update. Removed overrides. 2. If you are dead or reviving or teleport, then reset internal globals so that it continues again instead of waiting idle. 1. Fixed issue with Fates being out of order for SkyFire II Book. 2. For Fate "The Enmity of My Enemy", check if NPC to pop pre-req fate "The Enemy of My Enemy" is there. Pop and kill pre-req fate then move on to main fate. 1. If you are on Isle of Umbra for a fate, it will not try to run to the main city if you start and stop the bot. 2. See if can skips mobs that related to the order profile. 1. If a fate on your book is blacklisted, it will not move forward. Remove the fate from blacklist." GetHerDone, parrot and Tinytox like this. I am running the plugin with the Skyfire I book and so far it is working really well! I expect there can be some optimization for the profiles so if anyone has any additional XYZ coords that would help the profiles I am happy to update them. Thanks for the great work nishalp! EDIT: Navigation issues in Castrum Centri in Mor Dhona caused the bot to run back and forth. I submitted the log in the Navigation thread so hopefully that will get resolved. Would a short term fix of running the Mor Dhona 5th Cohort profiles last be possible? At least then if it locks it would not break the continuity of the plugin. Yeah, I noticed this. I can change the order for sure. The other thing is the profile for Mor Dhona can always port even if your in the zone. In fact it might be faster since your running to the other end of the zone. Let me know which route you prefer. If your still having this problem, post your log up and can look at it. I ran a full book last night and only problem was the navigation issues in Mor Dhona. Will keep a eye out also. Nice. Let me look at updating based on his new API's. This will make it much easier also to resume in the event you cancel or split up the runs. Yes. Please use the api as currently what you've got wont work for people running the game in any language other the english. Yep. Working on updating it now. Thanks for adding that in there. Need everyone help. Since you can only have 1 book at a time, I need to get the id's for the books. I could not get it on xivdb. Unless you happen to know Mastahg. If everyone can run the following in the reborn console and then paste the contents plus the name of the book they have open. I need to get the ID's for each book. I will keep the main post updated with the running list of what we get so we know what is pending. I have Skywind II already. Hello! I currently have a completed Netherfall I sitting in my inventory and would be happy to help, but I am a new user and don't know how to enter those commands into any console? I looked around the program interface briefly, cannot seem to find an input for a console. Thanks for all the data so far. There is some other data I need. I will get as I go along on my books but if you have the books it would help alot. In the Enemies - I need to know the zone and the mob to kill for each book in the order below from the image Grimm posted. Also I need the Fates from left to right. If I can get those for each book and I start posting the tool with the completed books to take care of the fates once I figure this one other problem that might be with the tool. Logically speaking, Skyfall I should be 4, Skyfall II should be 5, and Skywind I should be 7. 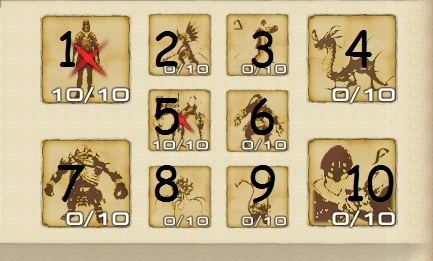 Zodiac Weapons - Final Fantasy XIV A Realm Reborn Wiki - FFXIV / FF14 ARR Community Wiki and Guide will give you info on each book. The mobs are listen in terms of the following picture, so you can adjust them as needed. I would do it myself right now but... currently it's almost 2 am and I am tired. The leves should be left to right as are the fates.